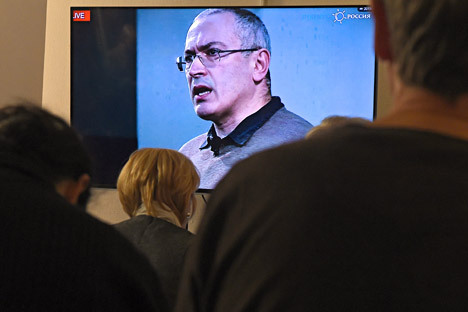 Mikhail Khodorkovsky is seen on a screen as he speaks via live video conference with journalists at the Open Russia movement office in Moscow on Dec. 9, 2015. The former Yukos oil company boss is accused of murder. Mikhail Khodorkovsky has been arrested in absentia and placed on an international wanted list, Russia's Investigative Committee (RIC) announced on Dec. 23. On December 11, RIC accused the former Yukos head in absentia of the 1998 murder of Nefteyugansk mayor Vladimir Petukhov. Khodorkovsky is accused of "organizing the murder and attempted murder of two or more people." He is also accused of trying to kill Vyacheslav Kokoshkin, who was accompanying Petukhov, and of attempts on the life of businessman Evgeny Rybin, during which a bodyguard was killed. The investigation affirms that Khodorkovsky decided to organize Petukhov's murder "in connection with his legal demands as mayor of Nefteyugansk (where Yukos' main production unit was located) that Yukos return the taxes it hid from the state," Vladimir Markin of RIC said. RIC links the attempt on the life of Rybin to his lawsuits against Yukos for the damages "caused by the oil company's illegal activities," Markin added. Already several people have been convicted for these crimes, among them Alexey Pichugin, former head of security at Yukos, who received a life sentence, and Khodorkovsky's former business partner Leonid Nevzlin, who was convicted in absentia. Can Khodorkovsky help organize a revolution in Russia? Commenting on the accusations against Khodorkovsky, Kremlin spokesman Dmitry Peskov said December 8 that they were brought after RIC obtained new ievidence in the case. Russian courts have already convicted Mikhail Khodorkovsky twice of economic crimes, for which he served a 10-year sentence. In 2013 Khodorkovsky was pardoned by Russian President Vladimir Putin. The businessman left Russia and currently lives in London. Khodorkovsky denies the charges, saying they are politically motivated. He continues to criticize the situation in Russia and Vladimir Putin's policies. Ekaterina Shulman a professor at the RANEPA Institute of Social Sciences, believes the murder accusations against Khodorkovsky are not a reaction to his political activity, since the émigré oligarch does not represent a serious threat for the Kremlin. However, Shulman also says that we should not expect Khodorkovsky's extradition to Russia. "It's clear that he will not return to Russia. The European Court recognized Yukos' second trial as political and, therefore, Khodorkovsky will not be extradited. And Interpol will not go searching for him."